Jael McHenry is a talented and enthusiastic amateur cook who writes about food and cooking. She is a monthly pop culture columnist and editor-in-chief of Intrepid Media, online a IntrepidMedia.com. Her work has appeared in publications such as the North American Review, Indiana Review, and the Graduate Review at American University, where she earned her MFA in Creative Writing. She lives in New York City. "For Ginny Selvaggio, the protagonist of Jael McHenry's captivating debut novel, food is a kind of glossary and cooking provides its own magic, whether it's summoning the dead or softening the sharp edges of a world she finds neither comfortable nor familiar. THE KITCHEN DAUGHTER is sweet and bitter-sharp, a lush feast of a novel about the links between flavor and memory, family and identity." "Magical, strong, and compelling, The Kitchen Daughter asks what is normal, how well do you know your family, and where does grief go? Jael McHenry blends seemingly unmixable ingredients into sustaining answers. I read this book in one satisfying gulp and smiled in comfort when I’d finished this distinctive, nourishing, and wise novel." "Jael McHenry's debut is a blast of fresh air, featuring an utterly original heroine who filters her view of an unpredictable world through her love of food. A fresh premise, terrific writing, and memorable characters blended beautifully - and made me devour The Kitchen Daughter." "Equal parts sweet and savory, THE KITCHEN DAUGHTER by Jael McHenry is a fresh story with all the comforts of home. Ginny’s ability to conjure ghosts while dabbling in family recipes is so touching readers will want to pull up a stool. A heartwarming debut." "This debut novel from Jael McHenry is everything you want in discovering a new writer. The Kitchen Daughter is subtle and effortless and emotional and lovely. The food and recipes aren't gimmicky add-ons, but integral to the momentum of the story -- and they make you want to run to the kitchen, except then you’d have to stop reading. It's a layered and satisfying tale." 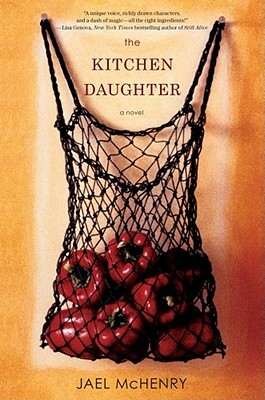 "Gorgeously written and uniquely delicious, The Kitchen Daughter follows an endearingly awkward character after tragedy upsets the fragile order of her world. Jael McHenry is a true wordsmith who shines in evoking Ginny’s perspective of family and food, her compelling sense of self, and her eventual understanding that you don’t have to be like everyone else in order to belong. A feast of words that makes you glad to be a reader." "Add a pinch of magic, a dash of heartache, and a generous portion of lyrical beauty and you have The Kitchen Daughter, an enchanting tale of familial loss and quiet redemption––I loved it."